Myopia, or nearsightedness, affects over 34 millions of Americans over the age of 40. However, within the age range of 12-54, this condition affects over 41% of the population. It’s predicted that by 2050, nearly 50% of the entire world’s population will be nearsighted. And the main reason for this is an epidemic of myopia in children, which is caused by the simple fact that they don’t spend enough time outdoors. What Is the Main Cause of Myopia in Children? The parents today are quick to blame video games and computers in general when it comes to explaining their kids’ eye problems. However, studies indicate that while spending long hours before a screen can increase the risk of conditions, like blepharitis or dry eye syndrome, it’s not the cause of nearsightedness. The main cause of this eyesight problem is the lack of light exposure in childhood. You see, myopia occurs when the child’s eye grows too fast. Our bodies naturally release dopamine in the eyes to control the process of development and keep it at a healthy level. However, that chemical is released only when the eye is exposed to lighting the intensity of 10,000 lux and above. The best level of lighting is about 40,000 lux. Indoors lights usually range between 300 and 500 lux. Therefore, the child’s eye doesn’t get that important ‘limitator’ of growth. The result of this is that it cannot adjust to its natural changes properly and develops a refractory error that is myopia. The eye itself becomes elongated and the change won’t go away completely even with surgery. 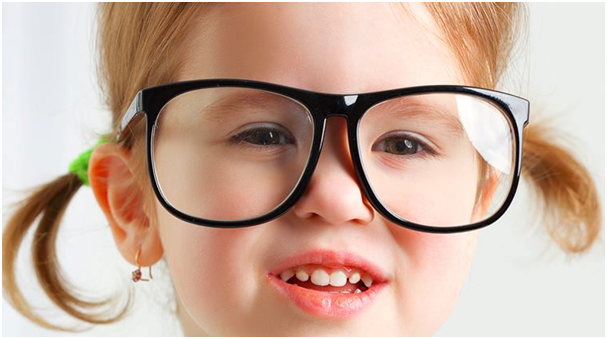 Note that genetics are a major risk factor for myopia in children. However, this isn’t the main reason for the condition, and neither is screentime. However, it’s true that kids spending more time watching TV or playing video games cuts down on their time outdoors. Considering what the main cause of the problem is, spending more time outside is the main preventative technique. However, one must be aware that the sunlight today is a threat in itself. UV damage is extremely dangerous to eyes as well as skin. However, as you can’t apply sunscreen on your kids’ eyes, you should use sunglasses. Be sure to choose models with lenses specifically designed to filter out UV rays. A hat or a cap that will shade their eyes is also a must. Just two hours a day outdoors, even on a cloudy day, reduce the risk of myopia in children by 50%. Installing high-intensity lights indoors will also contribute to your child’s eyesight protection. If your child already has myopia, not everything is lost yet. Spending time outdoors may still help reduce the severity of the condition. You can also use specialized lenses and eye drops designed for treatment of this disorder. Regular tests are an essential part of both myopia prevention and treatment. If there’s a history of the condition in your family, you’ll need to have your kids monitored from birth and start treatment whenever the first signs of the problem occur. The sooner you provide proper treatment, the higher is the chance of cure.